According to Singapore GP, the overall attendance at the 2017 Formula 1 Singapore Airlines Singapore Grand Prix was approximately 260,400, a 19% year-on-year increase. The number is higher than the average overall event attendance in its 10-year history. On the first day of the three day event, STB also delighted many race fans with the announcement that it inked a deal to host the FIA Formula 1 World Championship for four more years from 2018 to 2021. According to Meltwater, which tracked online reactions during the F1 event between September 13 to 18, 76% of reactions to the last-minute deal were positive, while 23% remained neutral. Only 1% reacted negatively to the news. 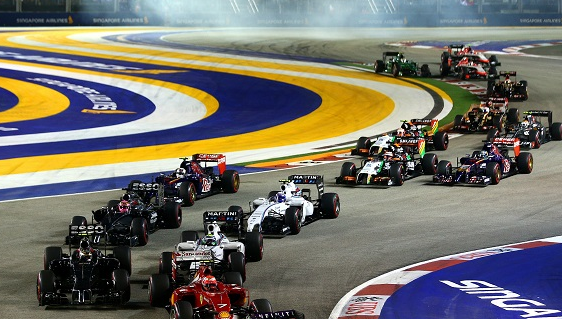 Neil Brennan, area director, Meltwater Japan and South East Asia, said that while the Singapore F1 Race generally creates a “huge amount of interest” across social media, and it was the renegotiated deal by the Singapore Government and the organisers that further bolstered buzz. Data from Meltwater showed that Singapore Airlines (SIA), the official sponsor of the Grand Prix, accounted for 85% of social media chatter, with sentiment surrounding the brand mostly positive during the F1 period. Positive mentions of SIA peaked at 88% on 14 September, eventually settling at 68% on race day. Other sponsors such as Heineken (9%), Rolex (4%) and DHL (2%) also generated online reactions. “F1 is a huge opportunity for brands to engage with existing and potential consumers. Not surprisingly, Singapore Airlines has done a tremendous job of the sponsorship deal – but the brand that stood out for its marketing efforts is Heineken, given that its association with the sport only began last year,” Brennan added. And despite all the online buzz generated during the weekend, there are still some who call the 3-day event a “vanity project” for Singapore. Refuting this claim was Russell Young, managing director, APAC, Sojern, who thinks the F1 Grand Prix is a “brilliant strategic move” by the Singapore to stay ahead of the curve. “By playing host to a global sport like F1, it has once again firmly cemented its status as a global city. It would certainly be a mistake to underestimate the positive impact the F1 has had on the economy and in helping to put Singapore on the map,” he said. Meanwhile, Jeffrey Seah, partner at Mettle & Salt, and venture partner at INCUVEST and Quest Ventures, said the F1 Grand Prix has evolved into “a transactional contract rather than a vanity or awareness project, as compared to the past”. “The original aim of getting on the world map has been achieved. The timely change of F1 ownership has lubricated the renewal process,” Seah said. Adi Satria, vice president sales, marketing and distribution for AccorHotels Malaysia, Indonesia & Singapore said the F1 Grand Prix enabled renewed interest in Singapore not only as a tourist destination, but also a sports and entertainment hub. He added that “effective” management of the event for the past 10 years has helped Singapore build a strong reputation. There is definitely a halo effect that makes travellers from around the region eager to experience or revisit the thrill and excitement that comes with the night race. Kat Olender, marketing and entertainment manager at CE LA VI and Peter Draminsky, general manager at Regent Singapore, concurred that the F1 period has brought about an increase in revenue and the number of travellers. In CE LA VI’s case, the restaurant saw a jump in revenue from last year’s F1 period, but did not share more on what the exact figures were. According to Olender, CE LA VI is now planning to build strong partnerships and create a focused strategy to target relevant audiences and remain competitive. “Being on top of the ball and releasing information early is also key. You don’t want to be caught chasing your tail in the last few weeks leading up to the event,” she added. On the other hand, Regent Singapore has experienced a shift in the type of hotel bookings. “Early on there was definitely a belief that closer to the course was better, but international race fans have discovered that transportation is easy and you can actually enjoy more of Singapore from other locations,” Draminsky said. For the past three years, Regent Singapore has been collaborating with STB through the Grand Prix Season Singapore (GPSS), and Draminsky said it has began working more closely with STB to be more involved in GPSS through initiatives at its Manhattan Bar, such as the Golden Glamour Jazz Night. Meanwhile, AccorHotels’ Satria said it takes a longer term view of the impact of the F1 Grand Prix by looking beyond occupancy and revenue to measure the success of the night race with its business. The hotel also sees this as an opportunity for it to leverage on marketing and customer engagement. For example, AccorHotels collaborated with FOX Networks to co-create video content and animated vignettes featuring FOX Sports presenter Brendon Julian, exploring Singapore during the F1 weekend. It has also ran contests targeted at its loyalty members in the previous years. What we’ve noticed is that consumers are increasingly craving that money-can’t-buy experience, which they can then show off about on social media. He cited the autograph sessions with F1 drivers at Raffles City Shopping Centre this year and photo opportunities with a mock podium as examples, which demonstrated that the mall understood the ways of bringing the experiential element to the fore. Customisation is an aspect that consumers also appreciate, Young said. “To truly delight customers, it’s not just about slashing prices, but about showing a thoughtfulness geared to the occasion,” he said. Young cited limited-edition bespoke cocktails crafted just for the F1 Grand Prix as an example. If you can offer both of these – an unforgettable, customised experience – you’ve won. Lawrence Chong, CEO of Consulus, said one way to stay ahead of the game is to consistently reinvent themselves, but merely talking about productivity or introducing robots alone is not enough. “What makes your experience stand out, what is the emotional bond that you seek to build with a global class of experience seekers becomes critical to thrive in this age of mobility,” Chong said. He advised marketers to not be “simplistic” and aim to understand what is truly going on as the retail scene becomes more “sophisticated”. The luxury goods group will reportedly launch its own multi-brand e-commerce site in March and offer all 70 of its brands on one s..